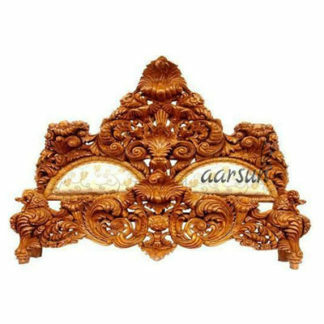 Aarsun woods promotes to you handcrafted wooden bed for home.The wooden bed is made from premium quality sheesham wood with traditional carving and finishing. The effortlessly stylish headboard and foot-board are decorated with splendid carving design. This wooden bed is strong and available with huge durability. Traditional hand carving designs in all their essence are utilitarian and carefully crafted to enhance the life of the furniture. This design bed will add to the decor of any bedroom. The bed designs have also been modified to suit everyone’s requirement. King size beds, queen size beds, single beds, double beds and so on are not the only options available in the market today. People are also trying out other options such as bunk beds for their children’s bedroom, four post beds for their master bedrooms, diwans for their living room and guest room and so on. Major details such as the natural texture of the wood, colour and texture of the laminate and upholstery play a major role to stunning look to the design. People can now choose from wood finish options such as Teak, Mahogany, Walnut, Dark Honey and Light Honey. They can also shortlist the upholstery accordingly. Options such as leather, leatherette, fabric, suede and so on are a popular choice. – made from solid Teak wood.